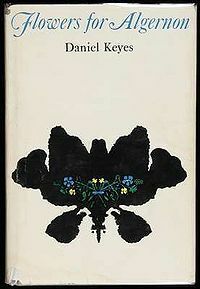 In 1958, Keyes was approached by Galaxy Science Fiction magazine to write a story, at which point the different elements of Flowers for Algernon fell into place. On submitting the finished story to Galaxy, however, the editor suggested changing the ending so that Charlie retained his intelligence, married Alice, and lived happily ever after. Keyes refused to make the change and sold the story to The Magazine of Fantasy and Science Fiction instead. Keyes worked on the expanded novel between 1962 and 1965 and first tried to sell it to Doubleday, but they also wanted to change the ending. Again, Keyes refused and gave Doubleday back their advance. Five different publishers rejected the story over the course of a year until it was taken on and published by Harcourt in 1966. Seriously? Did these guys also tell Shakespeare that Romeo and Juliet was kind of a bummer and he really ought to have Juliet wake up just as Romeo was about to take the poison — followed by a backslapping reconciliation between the Montague and Capulet clans and a joyous wedding between the star-bless’d lovers? Jeebus. What the hell kind of story is it if you give it a happy ending? What was up with these guys?